Guachinche (pronounced wachinchey) is a sort of primitive eating-house that originated in Tenerife where local winegrowers opened a makeshift tavern and sold a few simple dishes to accompany their wine. When their year’s wine had all been sold, they would close the establishment until the next year’s was ready. These guachinches became so popular in Tenerife that proper restaurants began to protest. Especially because the guachinches started offering more extensive menus, commercial spirits and other producers’ wines. The authorities stepped in and regulated the sector. Recently several guachinches have opened in El Hierro, and others have closed. They are not true guachinches because the person who runs them does not produce the wine, but that doesn’t matter to you, does it? You obviously won’t find them advertized in the restaurant guide, but driving along you may see a tatty hand-painted sign pointing down, or up, a side road. Go and have a look. A good tactic is to ask what they offer and when they are open so that you can come back another day. See how many people are there and what the food looks like. If there are tables with ten people happily shouting at one another and you see huge grilled pork ribs and jugs of “vino de pata” bandied about, you’re probably onto a good thing. Remember though, local people don’t eat at European times. They don’t turn up for lunch before two or three and nobody is ready for dinner before nine. 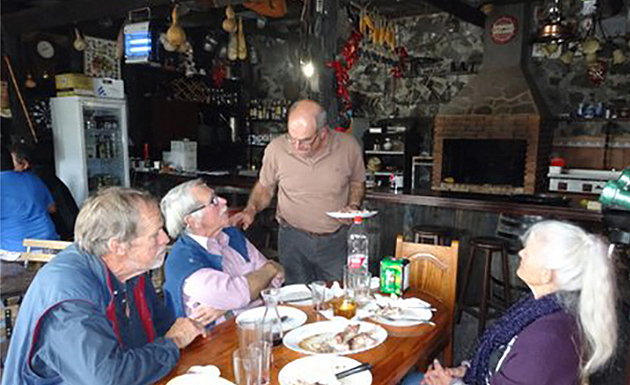 And don’t expect anything fancy: for starters fresh cheese or “garbanzas” – chickpeas in sauce; the main course is usually grilled meat – pork chops, pork ribs or steak – or perhaps they only serve grilled fish. Chips are more often provided than the famous Canary “papas arrugadas” – wrinkled potatoes. Be wary of salads. Dessert is most often reduced to commercial ice-cream from a freezer. One final suggestion: make sure you go with someone from the islands, preferably El Hierro. He/she will be able to make things easier and help create the jovial laid-back atmosphere that going to a guachinche implies.